In today’s fast-paced world, business professionals want fast, easy ways to communicate important information. With TX Text Control, developers can easily integrate powerful reporting and word-processing functionality into their Windows client and cross-browser applications. Text Control offers developer components for client rich text editing, spell checking, barcodes, server-based word processing, and reporting. The company also offers web services for server-side mail merge. Its products are popular worldwide among Windows Forms, WPF, and ASP.NET developers. 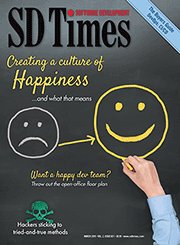 Text Control made the SD Times 100 once again for its innovations in the User Experience category. Earlier this year, Text Control announced TX Text Control X11, which is due in the third quarter of this year. It will include the industry’s first true WYSIWYG HTML5-based Web editor and reporting template designer, enabling identical output on screen, paper, and PDF. Because TX Text Control is fully Microsoft Word-compatible, users can load and save documents in industry-standard formats. TX Text Control X11 will allow the creation of documents and templates using any operating system with an HTML5 browser. Developers can include TX Text Control X11’s capabilities in tablet and smartphone apps as well as desktop and Web applications. It will have zero footprint. Meanwhile, developers can use Text Control’s powerful reporting engine and template designer in their Windows Forms, Windows Presentation Foundation (WPF) and ASP.NET applications to deliver advanced, flexible reporting capabilities. Text Control’s API makes it possible to post-process documents programmatically or modify them in the editor. “With TX Text Control, users can create reporting templates using Microsoft Word skills rather than a complex report designer,” said Bjoern Meyer, president of Text Control. TX Text Control also allows the reuse of Microsoft Word mail merge templates without needing Microsoft Office Automation or Micro­soft Word. In addition to providing 1D and 2D barcode support, it includes hierarchical reporting capabilities that enable the easy insertion of nested repeating blocks that include master-detail relationship views. On the back end, TX Text Control includes an out-of-the-box data connection wizard that connects to Microsoft SQL, Access, ADO.NET, and ODBC databases. Text Control’s TX Spell.NET allows developers to add extremely fast, highly reliable spell checking to their TX Text Control-based applications. Unlike most spell checkers, TX Spell.NET will soon be able to detect more than 50 different languages within multi-lingual documents so users don’t have to manually switch between dictionaries. “If you have a document that includes different languages, TX Spell.NET will use the proper dictionaries and activate the right spell checking and hyphenation,” said Meyer.